I just got a new toy: a device for measuring blood ketones. This is a far more exact and reliable measurement than testing for urine ketones using cheap dipsticks. Ketosis is of course the state the body is in when eating very low carb. Ketones, made from fat, will then fuel the brain instead of glucose. So who needs one of these gadgets? Perhaps nobody. Obviously it’s easy to eat LCHF without it. This is for curious nerds (like me) and for those who want definite proof that they are eating so little carbs that insulin levels are low and fat burning is maximized. A ketone level somewhere between 1.5 – 3 is said to be an optimal level for maximizing weight loss. It means that insulin levels are very low. As you can see my first measurement was 0.2, after a caesar sallad dinner. I’m not surprised as I’ve probably eaten at least 50 grams of carbs a day lately. I will try it out fasting in the mornings during the coming days. Perhaps I’ll try being really strict with the carbs for a while to see what happens. Have you tried one of these or are you interested in doing it? After a huge weight loss and health improvement five years ago with very low carb, I've been backsliding in weight gain and health for the last few years, despite rigorous very low carb diet. I got this meter and lo and behold, I wasn't anywhere near ketosis. As soon as I cut WAY back on protein, a la Volek/Phinney/Moore, I start going into ketosis again. I've played with this up and down a couple of times now, and it's totally repeatable even over a single day. I had to drop from an average of 150g protein/day down to around 70g protein/day. That's pretty close to the "0.5g protein/lb lean body weight" amount suggested by Volek and Phinney. Also, my fasting glucose dropped when I dropped the protein. It bounces around a lot, but the trend seems to be upper 90s before, low 80s afterwards. It doesn't seem to matter how many calories I eat, or how much fat I eat. Ketosis seems to be directly tied to the ABSOLUTE amount of protein and carbs I eat. Once I've hit my protein and carb limit for the day, I can stop eating or I can guzzle pure fat; it doesn't matter. This holds true whether I eat 800 or 1600 calories in a day. It basically means I have a meat and eggs budget for the day (my two largest sources of protein). I don't think it's really about the macronutrient ratio in your diet. I think it's about absolute amounts that you can tolerate. I think focusing on percentages of macronutrients just confuses the issue; if you eat 70g of protein each day, the daily percentage of protein will change if you eat 800 calories one day and 2000 the next. Percentages only make sense in the context of a constant number of calories. It's not mathematically incorrect to talk about percentages, it's just a more indirect way to calculate things. Just like expressing your carb limit as 20g/day; it's much simpler to track. I bought the ketone strips from the Canadian pharmacy that Jimmy mentioned in his original post. Much cheaper, but they did take almost a month to arrive. But even at high US $ rates, I think a pack or two of strips is a worthwhile investment if you aren't already dialed into steady weight loss. No, no they do not. People end up in the hospital for keto acidosis not for having ketone bodies in their blood. You should research a ketogenic diet and its effects and benefits on health before posting. if you eat fat, your body needs to burn that before it can tap into your body's stored fat, correct? If that is the case, you should see ketones in urine/blood after consuming fat, without signifying that you are burning stored fat. Right ? If you are interested in detail how ketosis works , I think Peter Attia have written some really good posts. I've been doing keto since June of2015. I've had the precision x ketone/glucose meter. I've gotten the strips 100 for $150) so I test a lot. The only time I've gotten to 1.5 and above is when I'm outright fat fasting. Beyond that it rarely goes above .7. My weight loss is often stalled, in the 10 months I've been eating this way I've lost 57 lbs. I started at 304 lbs, I honestly need to get down to 180 or so (I'm 5'10" woman, 35 years old, big build). I've found the smallest thing (1/2 cup berries) will drop my ketones down to .3. Anyway what can I do to tweak things? I don't expect fast weight loss, I've gotten over that. 10 years ago I dropped 120 lbs in a year and I've read about the one golden bullet everyone gets. I used and squandered mine. Anyway I've read several books, keto clarity and the art and science of the low carb lifestyle Etc. Loved those books but I guess I am trying to use my precision xtra as a tool to see what effects my levels but I haven't been able to find anything really concrete as to how long should I test after eating, how much these numbers really matter, whether it's the fat in the food effecting the numbers or if it's my fat releasing? I'm also considering trying to just load up on pure fat for a few days, more of an extreme fat fast, like 2000-3000 calories of 90% + fat to see if that helps? Oy sorry for rambling just a little frustrated at how slow the results are. I'd be happy with a consistent 1-2 lbs a week lost. Also I don't exercise because I am afraid of producing cortisol and preventing fat loss. @Becca: when you say you've gotten the strips 100 for $150, do you mean the keto strips for the Abbot Precision keto-glucometer? That's the lowest price I've heard of. Could you tell us where or how you got them, and was there any difficulties etc? Stephen , I'm in Brazil and I've been doing LCHF for quite some time. At the beginning I didn't lose weight and I believe or rather know I was eating too much protein. I took the two week challenge, bought Dr. Andreas's "TOY" and in the middle of the challenge, after one week I had light ketosis with a reading of 1.5 Now a few weeks later after reducing the amount of protein and upping fat consumption, +/- 20 carbs, I'm in "Optimal Ketosis" Toy reads 2'6 I'm not fasting , although on Mondays I have a Fat Coffee, (Bullet Proof coffee with butter and Coconut Oil) at Breakfast and eat around two o'clock. I suppose this might constitute Intermittant Fasting, 16-8. Not hungry very often and eat dark chocolate every day. Don't count calories. Really enjoying this way of life! Sheila you will lose more fat if you limit your protein like I did. I weigh 64 kgs. and I need 57grams of protein a day. There is a site where you can check how to regulate your macronutrients. It's about one gram of protein to each kilo of weight. Google "Keto Academy" you'll get there, if you reduce the protein and eat more fat you'll lose quicker. I don't know why people are so quick off the mark to declare incorrect facts. Why would she be reading this site if she's so ignorant of the basics of LCHF? I have the Abbott Precision Xtra glucose and Ketone meter, purchased it on Amazon. The ketone blood testing strips are very expensive however I found an online drug store "universal drugstore" and the strips were significantly less expensive when purchased from them. My blood ketone levels range .8 to 1.5. I keep a log of everything I eat and test my blood several times a day. I admit I have a very sedentary lifestyle and hate going to gyms. I don't know how to stay in the optimal ketone range? I hit it once a day and then fall back to .8 or .9. Any suggestions? Cassie, you are misinformed. A ketogenic diet is based on high ketones (.50 to 3.0) and LOW blood sugar. Ketoacidosis occurs with high very ketomes(over 10.0) and HIGH blood sugar. As a type 2 that once had a bout with ketoacidosis, i know the difference. A ketogenic diet keeps blood sugar down, so ketoacidosis is never a concern. Becca, i have a small fb group ketogenics 101, and what i have found to be very successful is a combination of a ketogenic diet coupled with a 5-2 fast protocol. Join me there for more details. Not trying to sell anything, just sharing info. Has anyone here supplemented with exogenous ketones? Im in the market for the blood glucose/ketone meter, since i do supplement along with my keto diet. I'm curious what my levels are since I feel amazing and have great results. Best ketone meter? Most economical? Is there a different between a blood glucose monitor and a keto monitor as my blood glucose in the morning is usually 6.mmo/L and drops through the day. My evening reading is about 4. My weight loss had stalled and it had been very frustrating -- I have not been cheating. I started fasting from my evening meal till lunch the next day, and weight loss started again. Although it was an emotional topic at first, I found that not only did I not need the extra food, but I had no ill effects either -- I've been on LCHF for about 7 weeks now. My blood ketones tested at 2.2 after my evening meal tonight, so if I read the information correctly, I am now in an optimum fat burning range. None of this showed in the urine strips, so I would highly recommend using a blood test monitor for ketones. I found a deal at one company (direct from the manufacturer) for a free meter, and a good price on 20 keynote test strips, so it's not that expensive unless you test multiple times a day. I am not diabetic yet, but there was also no qualifying to get the free meter. Timely post ! I was fascinated by the details . Does anyone know if my business could get access to a fillable NY DTF IT-214 document to type on ? Who determined that .5 was ketosis?. I eat under 25 carbs a day and rarely get past .5 but mostly am at.2 and read that that is the start off ketosis. I've lost several pounds and inches as well so doing something right so not sure who claims only .5 is keto. I've been on it since February, I've gone through keto breath and positive urine strips to verify so I know at.2 I was in ketosis. Urine Strips no longer work. Jody, I have metabolic syndrome. My doctor put me on exogenous ketones by PRUVIT. I love it .. I feel so much better. Losing weight is a side benefit. Fatty acids constantly leave fat cells and return. I am guessing consumed fat just joins the mix. Help! I recently purchased a keto blood meter. I have been following a ketogenic diet for 2.5 years. I lost 60 lbs but need to lose at least another 20. I have been stalled for over a year. I adjusted macros in every conceivable way, ranging from 60-85% fat and 35-10% protein, keeping carbs at or under 5%. I have adjusted calories at various levels, from 1500-2200. I also don't eat dairy. I cannot seem to get a blood ketone test higher than .4, which probably explains the weight loss stall. I work out 6 days per week - heavy weight lifting 3 days/1 hour per day, cardio 3 days/1 hour per day. Lately, I have been continually upping the fat (today I'm trying for 90% fat, 5% protein, 5% carbs) and decreasing the protein in a desperate attempt to change the blood ketone reading and lose weight. The meter (which is not broken since my spouse achieved a 1.5) consistently reads .4, no matter what I do. I have had bloodwork done and everything comes back normal. Any suggestions appreciated! "Help!" "...work out 6 days per week..." "...desperate attempt..."
Stress may have a lowering effect on ketones in the blood. Becca I know it has been while since you posted this but I want to know more about the "one golden bullet everyone gets" then your next sentence states you used and squandered yours. What is this one golden bullet to which you are referring?? Thank you. I'm new to this - started on Monday. I'm 55 and weighed 62k at 173cm tall. Today I weigh 60.3kg. I tested my ketones using the device measuring my blood on Tuesday and it read 0.5 tonight ?Thursday I'm at 2.1. The optimal fat burn is between 1.5 & 3. Bearing all this mind I would retrace your steps and go from the beginning again. We may have different metabolisms. Good luck. 5 and above is considered entering ketoacidosis. Check with your doctor, licensed nutritionist, or endocrynologist. 0.5 is not ketosis or anything near ketoacidosis. Ketosis is 1.0 and higher up to 4.5. 5.0 and above is entering ketoacidosis. Check with your physician, your nutritionist, or endocrinologist. I have found that I need to stay around 10 net carbs/4%, 10-15% protein and the rest fat, about 80%. I also eat so I have a pretty large deficient of calories. I got the free Cron-o-meter app from Dr. Mercola website and was able to put in my custom macronutrients goals. This allows me to pre-plan my meals and everything I will be eating that day so I can look over and tweak to get food where it needs to be. I have my blood ketone meter and strips, but was waiting to make sure I was at or near Ketosis before starting...about ready. I am eating a theraputic ketosis diet for medical reasons, but I have yo yo dieted for three decades due to a stubborn thyroid problem and weight comes off slowly for me. With these percentages I have been losing about a pound a week, not as fast as I would like, but better than I have done with any other plan and I feel good and am never hungry. Oh, surprisingly, I got my Free Style brand meter for free at my local pharmacy via a cashback voucher. Like computer printers and ink cartridges, the manufacturers make their money selling the test strips. 08-1.2 g per kg of protein. Im at 200 pound, 10% bodyfat and keep my protein around 100 grams a day, BCAA spares muscle breakdown (specifically alanine) so no worry there. Amazon has (Urinalysis Test Strips, Ketone Strips for Use in Ketogenic, Paleo, and Atkins Diet, 99% Accuracy, Suitable for Diabetics) 100 pack for $8.76 lightening deal ends in 15 minutes. It is now Monday October 31st 9:33am.ays strips but not sure if they go with the device or not. Hi! Nice to hear your story! Have you had good luck since? I just started w the trips. Where did u get ur meter? I just started w the strips. I find them very inaccurate? Do u have to fast b4 u eat!!! Hi Jody, I use the Nova Max Meter and strips. They are the least expensive I've found and seem to be accurate. You can get the strips in packs of 40 on amazon for around $63. These meters are made for people with type 1 diabetes, specifically those who use an insulin pump. So, there are people out there who ACTUALLY need one of these and for whom is a critical device. Ketosis is the state of having ketones in the blood stream. Diabetic Ketoacidosis (DKA) is the state caused by diabetics with uncontrolled blood glucose levels, and no insulin to cause the cells to be able to utliize the glucose floating in the blood stream. The body inability to utilize the glucose for energy forces the body to begin to use fat as a fuel source, the byproduct of which is ketones. The shift of potassium ions into cells, and hydrogen ions out of the cells casues the acidic portion of the ketoacidosis phenomenon. These people are more affected by the acidosis of the bloodstream than by the actual ketones. On a well formulated ketogenic diet, you ketones are generally between 0.5 - 3.0mmol/L, but pH levels are normal (between 7.35 - 7.45). 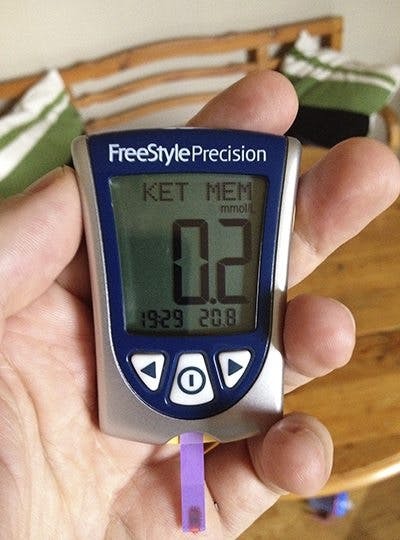 The condition of nutritional ketosis is much different than that of DKA. Ketones are not harmful unles they become in the ranges of 15mmol/L ior higher, which through scientific trials, they have proven to be unable to achieve through any oral diet. Ketosis has been shown to metabolize fat, improve lean body mass, and improve HDL, LDL, and triglycerides! The research is out there and it IS CREDIBLE. This is informational only, I'm not trying to be a smart alec. Anyone who is taught anything about ketones and DKA would probably think ketones are a bad sign. They tell diabetics who still eat carbohydrates to test for ketones just to see if their body's metabolism is completely unable to metabolize the sugars in their bloodstream, and to find out if their blood sugars are being utilized or just free-floating and destroying their pH balance, their blood vesels, their inflammatory response, their healing process, their electrolytes, etc..... The ketones aren't really the bad guys; the blood sugars and the acidosis is what is hurting a person in DKA. Can't imagine a "Doctor" saying "So who needs one of these gadgets? Perhaps nobody. " Have you not heard of Type One Diabetes? Have you not heard of people dying from ketoacidosis? So I started LCHF along with my Type 1 son to help him transition to better blood sugars etc. I have checked my ketones with our blood ketone Meter yesterday and the day before and came up with 5.6 & 6.0. I see most places state nutritional ketosis is up to 3.0. Are these levels of ketones "bad"? How can they be so high when others can barely get to a 1.0. I have been quite LC this week with mostly getting carbs from veggies, my creamer, and some strawberries etc. If this is bad, what do I do to fix it without knocking myself out of ketosis. Although I am doing LC to support my son I would like to see the weight losss and physiological benefits as well. Final question would having 6.0 ketones cause me to be dizzy, light headed and generally weak even with a BG of 82? This morning I woke up like this and was convinced my BG was low but it proved otherwise. Oh I am doing IF well and had been fasting from 6pm last night. Checked ketones at like 3-4am because I was up Checking on my son. Becca where did u get the 100 strips for $150?!! Willis Morse, this has been really helpful advice, thank you! I've had been eating less than 20gms carbs and 140+ protein every day (strictly meat and eggs, no dairy) and plenty of fat for 2 weeks and I couldn't understand why I wasn't in ketosis. My lean body mass is 180, so have dropped down to the 0.5 g protein per pound as you suggested, now eating typically 90 gms protein per day, sometimes only 70 g, and only eating extra fat than usual if on certain days I'm not satisfied by that protein limit. I find that I typically only require one meal a day and feel great. One of my takeaways from this experiment is that when I started this ketogenic diet I was finding that I felt quite satisfied at 50 - 70g of protein per day, and anything significantly more than that, such as some of the guidelines that I had read that told me I needed to be eating between 150-200 gms of protein every day given my lean body mass of 180+, was a huge struggle for me to eat, so iI think it's important to pay attention to your satiety and keep protein to a minimum when starting on the diet. Also, I am a bodybuilder and have been for close to 10 years and had previously been consuming around the bodybuilding guideline of 2 g of protein per kilo of body weight. Then, around 2 years ago, I read Brad Pilon's "Eat-Stop-Eat" book about intermittent fasting and his recommendations for weight training athletes to dramatically decrease their protein in-take when utilising intermittent fasting to assist in the building of and maintenance of new muscle. His recommendation based on his own history of bodybuilding and experimentation with protein reduction and the available science led to me decreasing from 150-200 gms protein per day to as little as 50-70gms per day, and I was shocked to see that not only did i continue to gain new muscle but had become leaner as well. In recent years I had gained significant fat due to my age, now 43 , and a decrease in insulin sensitivity, so have had to cut back on carbs to lose the weight. From my personal experience, I would advise anyone reading this who does significant weight lifting that you can consume less than half the prescribed gms of protein that the bodybuilding guidelines dictate and still gain muscle and fast. Also, get a copy of Brad Pilon's e-book discussing the science behind how little protein you actually need to maximise muscle synthesis. I've been doing intermittent fasting along with 20 or less carbs average this past week about 7-10 carbs. I tested my ketones this morning before drinking or eating and they were 2.0. I tested again after eating and they were 5.0. Is that because I consumed fat with my eggs? My blood sugar fasting or not stays around 75. I also have been having a lot of pain inflammation with cold weather would that raise my ketones? Should I be concerned? I have been on ketogenic program for 19 days. Bought precision blood monitor to measure ketones. Tested today and was .9, what does this mean? I can't find anything about levels this high. I do have low thyroid and take medication for it. I just got my Care Touch Ketone Testing Kit yesterday. I tested last night and my reading was 1.7mmol and I tested this morning after a 12 hour fast and it was 3.9mmol. Is that normal. I've been on the diet for one month now and have lost 27 lbs. I was 316 lbs and I'm 289 lbs now, I'm a 40 year old male. I just want to make sure that I'm not doing anything wrong cause 3.9 seems high. Normally you don't have to worry about a bit higher ketone levels. But if you are an insulin dependent diabetic then you should be more careful. Im really happy because i have no cravings, Omg I really don't have cravings. Im full mostly, and i eat when my body wants me to eat. Cake is my downfall, since keto, i can sincerely tell you that I can resist because that watery feeling in my mouth, is not there anymore. My keten level today was 2.5 after fasting for 16hrs. You can do this. I thought i couldn't, but I see that i can. So can you. i have been on zero carbs for two months and did a finger prick test and it tells me my ketones are at 0.2.. what gives? How are you measuring 0 carbs? Eating an all meat diet?